Goodreads: When Hitler ordered the total annihilation of the small village of Lidice, Czechoslovakia on June 10, 1942, a pair of newborn twin girls was secretly hidden from the Nazis while their parents and the rest of the village were massacred. The son of one of the infant girls, CIA Agent Myk McGrath, has become the world’s most prolific agent. Now he’s on a frenetic search to catch a cunning group that has outsmarted the country’s highest intelligence agency and vanished from their watchful eye. In the midst of Myk’s hunt, a defector arises whose allegiance is unknown, a defector with ties to Lidice. China’s top physicist is snatched from his beach vacation and forced to replicate his breakthrough discovery in electromagnetic technology. New York City awakes to a terrifying phenomenon: seventy percent of its electricity has been permanently wiped off the power grid. Myk is in a race against time to find who’s behind the attack and prevent an already fragile U.S. economy from turning into a calamity. In his pursuit, Myk begins to piece together a lifelong enigma: why his mother and her twin sister abruptly ended their relationship at the time of his birth, and why his mother developed within him the skills that would make him the most prodigious agent the CIA has ever known. The deeper he digs into exposing a devious conspiracy against the U.S., the more he uncovers the stunning truth about the secret lives of the twins from Lidice. Kritters Thoughts: An interesting take on political thriller with current and historical themes tying together - this peaked my interest and kept my attention until the end. Myk has an interesting past, but doesn't know everything as his mother kept some things from him and he is closely tied to the Holocaust. The new modern terrorists are intertwining with relatives related to the Holocaust and taking a modern take on it. 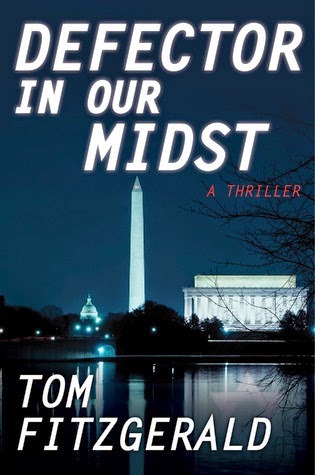 I was a religious studies major in college and now live right outside of DC, so the mix of religious themes and political thriller were right up my alley. I loved how this employee of the CIA was not just a CIA suit, but also had a personal life that interfered with his investigation. This may sound crazy, but I sometimes feel like the police or agents of such don't have personal lives that affect their work when in real life they bring work home and sometimes home gets taken to work like any other person, I loved that part of this book. The one thing that made some moments slow was having to remember who was on what side and what their beliefs were and what they were fighting for. It took me a few moments to get a little chart going to understand where they all fit in the puzzle. If you like political thrillers but have read so many that they seem the same over and over again, this was something new to add to the mix.